David defeated Goliath by striking him on the forehead with a stone from a slingshot. How did David do it? The key quantities are the energy and speed of the stone. The greater the energy, the greater the damage to the target (Goliath's head), and the greater the speed, the less likely Goliath will be able to dodge the stone. 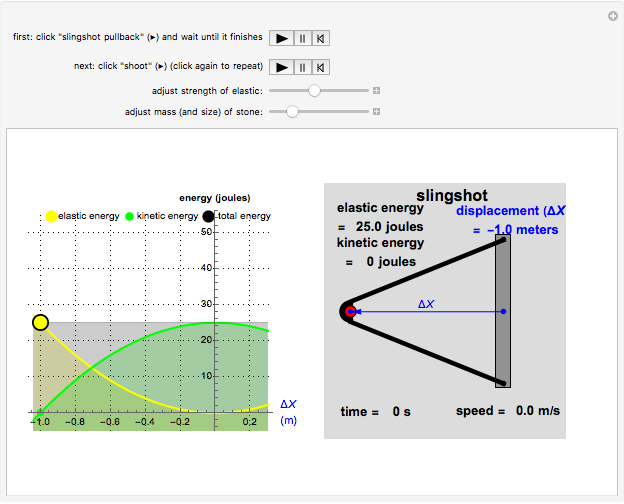 This Demonstration shows energy being transferred to the elastic bands of the slingshot and then to the stone as energy of motion (kinetic energy). You can vary the mass of the stone and the strength of the bands. If you were David, how would you maximize the kinetic energy and speed of the stone? Would you use a heavy or a light stone, and strong or weak elastic bands? Investigate to find out! 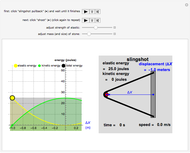 This Demonstration is intended only to illustrate the principle of conservation of energy. Polymers with requisite properties and other technological advances in slingshots were not available to David at the time (fortunately for Goliath?). As the slingshot is pulled back, chemical energy is transferred from David's muscles to elastic energy in the bands of the slingshot. 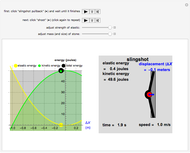 After the slingshot is released, the elastic energy is transferred to the stone as energy of motion (kinetic energy). You can generate maximum energy and maximum speed by using a light stone and strong bands. However, you may have noticed that the kinetic energy transferred to the stone does not depend upon its mass! 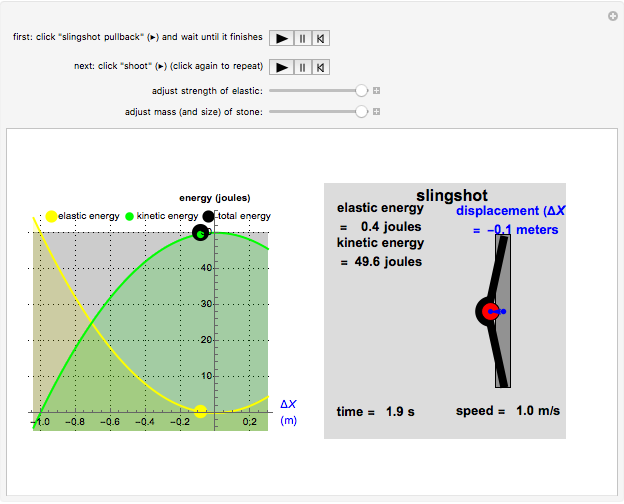 This Demonstration is a model of a real slingshot, which is based on certain idealizations and omissions of features of the real world. A model's reliability depends on the extent to which its assumptions are valid. 1. All of the energy stored in the elastic bands is transferred to the stone as kinetic energy. In fact, the elastic bands themselves gain speed and some kinetic energy. In most cases, the stone carries away essentially all of the elastic energy. But if the mass of the stone is small, comparable to the mass of the elastic bands, about an equal amount of elastic energy becomes kinetic energy of the bands themselves. Thus a smaller stone would gain less of the available elastic energy. One would therefore not want to reduce the mass of the stone beyond a certain point, maybe two to five times the mass of the bands. As is often the case, the best compromise is most easily worked out experimentally rather than theoretically. 2. At low speeds, air resistance has no effect on the energy and speed of the stone. As the speed of the stone increases or its mass decreases, however, air resistance might become more important. Thus air resistance also limits the advantage of reducing the mass of the stone, as described in 1 above. 3. The shooter can draw the slingshot back the full 1.0 m every time, no matter how strong the elastic bands. In fact, the strength of the shooter's arms places a limit on the strength of the elastic bands. If the shooter cannot stretch them the full 1.0 m, the elastic energy and the kinetic energy of the stone will be reduced. This places a limit on the maximum strength of the bands. Before he goes out to confront Goliath, David should build up his arm muscles and use the strongest bands that he can stretch on the slingshot! Inspired by "Matter and Energy," Chap. 4 in R. Karplus, Introductory Physics: A Model Approach, 2nd ed., Buzzards Bay, MA: Captain's Engineering Services, Inc., 2003. Fernand Brunschwig "Energy of a Slingshot: David and Goliath"